Click here to read a full discussion with Dr. Dang where he discusses the importance of a pediatric eye exam, how often to bring your child for pediatric eye exam and what constitutes a thorough and comprehensive pediatric eye exam. Vision and learning go hand in hand. Did you know that many common learning disorders or developmental delays may be caused by an undetected vision condition? A child who cannot see the board clearly or focus on a computer screen is at a strong disadvantage in the classroom. Regular eye exams for kids are therefore critical for helping kids to make the grade in school. Our Pearland optometrist is experienced and skilled at examining children’s eyesight. Vision problems are common in children, and our Pearland optometrist diagnoses many common eye conditions in our family-friendly practice. In fact, education experts estimate that approximately 5 to 10% of all preschool-aged kids have a vision condition. This number rises to 25% of all school-aged students, as kids get older. Our pediatric eye exam in Pearland, TX, is the most effective way to prevent many learning difficulties. To underscore the importance of routine eye exams for kids, some states even mandate them before entering elementary school. Your family physician will generally evaluate your child’s eyes and visual system during a regular physical, and you will be referred to a Pearland eye doctor if any problems are suspected. In our office, we will check your child’s basic visual capabilities. This includes an assessment of near and far vision, eye mobility, binocularity, peripheral awareness, accommodation (focusing ability) and eye-hand coordination. Children should be brought for their first eye examination as infants, around 6 months old. The next check-up should be done at 3 years old. Before entering first grade – around 5-6 years of age, it is highly advised to book an eye exam. If your child doesn’t need vision correction, then follow-up evaluations during school-aged years can be scheduled every 2 years. However, if your child wears eyeglasses for contacts, then annual eye exams are strongly advised. At our Pearland eye care center, we’ll greet you and your child warmly and sit down to talk when you arrive for your child’s eye exam. It’s advised to schedule this initial exam for a time of day when your child is generally happy and alert. We’ll ask you to fill out a case history file, answering questions about your child’s perinatal history, medications, family eye conditions and allergies. This is the time to share any concerns you may have about your kid’s eyesight, for example: if you’ve noticed frequent eye rubbing, excessive blinking, failure to maintain a gaze or make eye contact or weak visual tracking skills. It’s also critical to mention if your child failed a vision screening in school. Our Pearland eye doctor will check how your baby’s pupils open and close in response to light. We’ll also assess preferential looking by showing cards with patterns and stripes to your infant in order to pay attention to his/her gaze. At 3 months old, infants should be able to fixate on an image or object and track the movement. Called fixation testing, we’ll also perform this important evaluation. 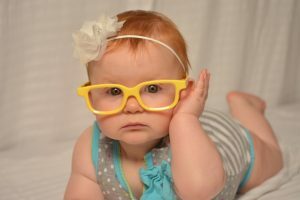 Altogether, the results of these tests done by our Pearland optometrist provide important details about the development of your child’s visual system. Have no fear, even if your child hasn’t yet mastered the alphabet, our Pearland eye doctors will still be able to perform a thorough, accurate evaluation of your child’s vision. Instead of reading a standard eye chart with letters and numbers, we’ll ask your child to view and identify specially designed images, such as an apple and a house. Other techniques that we may use include random dot stereopsis, which checks eye teaming capabilities, and retinoscopy, which assesses how light reflects off the retina. This provides our Pearland optometrist with important information about a refractive error. Testing visual acuity, with the aid of eye charts and other technological tools that will help us to diagnose nearsightedness, farsightedness or astigmatism. This is important for determining if your child needs vision correction. Trouble with Accommodation: this is defined as a weak ability to focus, especially when switching between near and far vision. Strabismus: misaligned eyes and/or eye muscle weakness are generally to blame for this condition. Surgery may be recommended, depending upon the severity. Eye Teaming Problems: when binocularity isn’t strong, your child’s eyes are not working well together. Depth perception and coordination are often compromised. Convergence Insufficiency: it may be hard for your kids to maintain eye alignment, which impacts reading skills. Eye exercises and vision therapy are usually effective treatment. Our friendly Pearland optometrist at Texas State Optical, is highly experienced at pediatric eye exams. Call today to reserve an appointment for your child! Better vision also means more quality of life, as sight is our most important sensory organ. 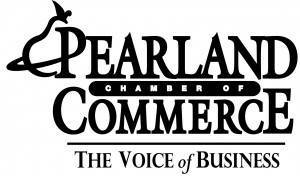 Our Pearland Eye Care Clinic makes it a policy to ensure that all staff members are up-to-date on the latest technology and techniques to make your visit as comfortable and effective as possible.